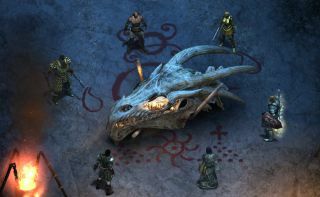 After previously being available to Kickstarter backers, The Road to Eternity, Obsidian's feature-length documentary detailing the making of Pillars of Eternity, is now available to view in its entirety on Vimeo for £0.66/$1. An hour-and-a-half long, The Road to Eternity picks up as things were looking bleak for the company, then charts the path from the breakthrough crowdfunding campaign to the eventual release of Pillars. Game director Josh Sawyer, executive producer and lead programmer Adam Brennecke and CEO Feargus Urquhart pop in to share their experiences. Pillars of Eternity is one of my personal highlights of this year, and I know it has fans among the rest of the PCG team, but that's not why this interests me. I'm big on documentaries, so I find it hard to complain about anything that explores the human aspect of gaming that wasn't filmed on a webcam. The BBC and the rest of the old guard typically cover games in a superficial, slightly baffled sort of way, and developers have picked up the slack: companies like Valve, Double Fine and now Obsidian. There's no doubt, of course, that these documentaries will end up showing the game or studio in a good light, but 66p for properly edited insight into the development process? I'll take it.